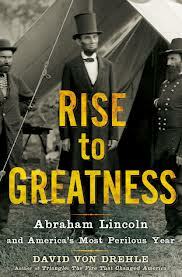 Rise to Greatness by David Von Drehle was a solid work of historical non-fiction that chronicles Abraham Lincoln's actions throughout the year 1862 leading up his Emancipation Proclamation in early 1863 that freed the slaves in Rebel territories. Von Drehle writes for Time Magazine and previously wrote the excellent book Triangle: The Fire That Changed America on a deadly 1911 New York garment factory fire and this book on Lincoln was of interest both from Von Drehle as the writer and because of the subject. Several year back I read the Doris Kearns Goodwin book Team of Rivals: The Political Genius of Abraham Lincoln and found it to be a compelling work. Rise to Greatness was certainly well written and incredibly thorough with lots of material around how Lincoln lived firmly in a world of what he could accomplish, not what he wanted or was authorized to do. A huge piece of this concept manifested itself in Lincoln's actions during the year with General George McClellan, a military leader with a loyal partisan following, but who wasn't taking the aggressive steps needed and which Lincoln sought. It was very much within his power as President to replace McClellan at any time, but doing so at the wrong moment could have had disastrous consequences for Lincoln's overriding goal of keeping the Union together. Overall, it was an excellent book, but the focus of this one extremely important calendar year narrow enough that if someone wants to read an excellent full biography of Lincoln, Team of Rivals would probably be the one to pick up prior to Rise to Greatness.